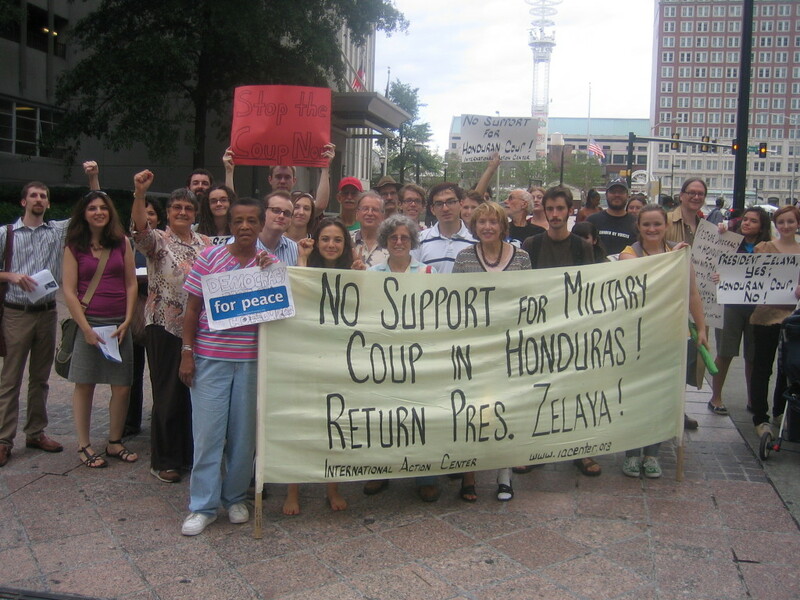 (APN) ATLANTA — A coalition of local human rights activists held a downtown rally in solidarity with the people of Honduras, Friday, August 28, 2009, marking the two-month anniversary of the ouster and forced exile of Honduran President Manuel Zelaya. About 40 activists handed out leaflets, held banners and signs, and spoke to curious passers-by. On June 28, 2009, the Honduran Supreme Court ordered the military to arrest Zelaya and usher him out of the country, clearing the way for Roberto Micheletti, who was the President of the National Congress, to become interim de facto president. 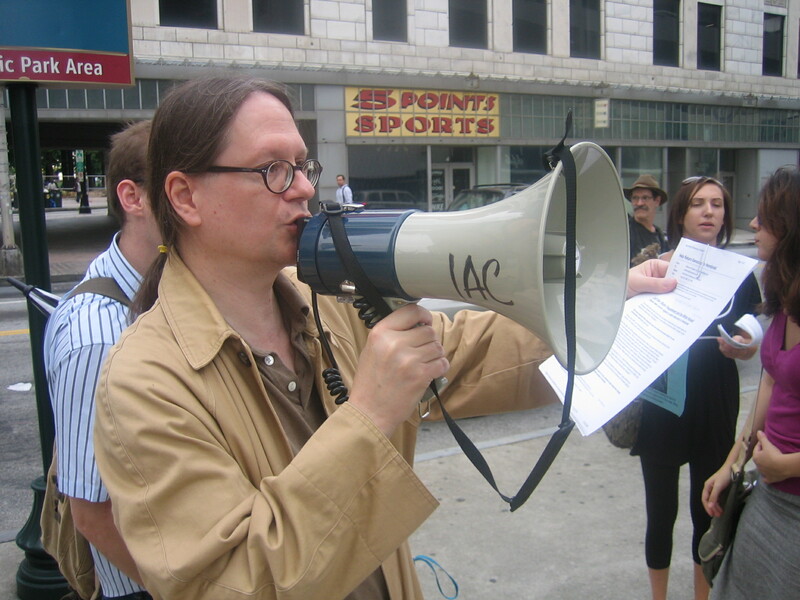 “The coup leader is illegitimate,” activist Mike Vosburg-Casey said. “They assumed power via military force.” As previously reported by APN, Vosburg-Casey spent time in federal prison after protesting the School of the Americas military training academy in Fort Benning, Georgia, a couple years ago. Incidentally, the School of the Americas Watch has since claimed that the Honduran coup leadership received training at the SOA. 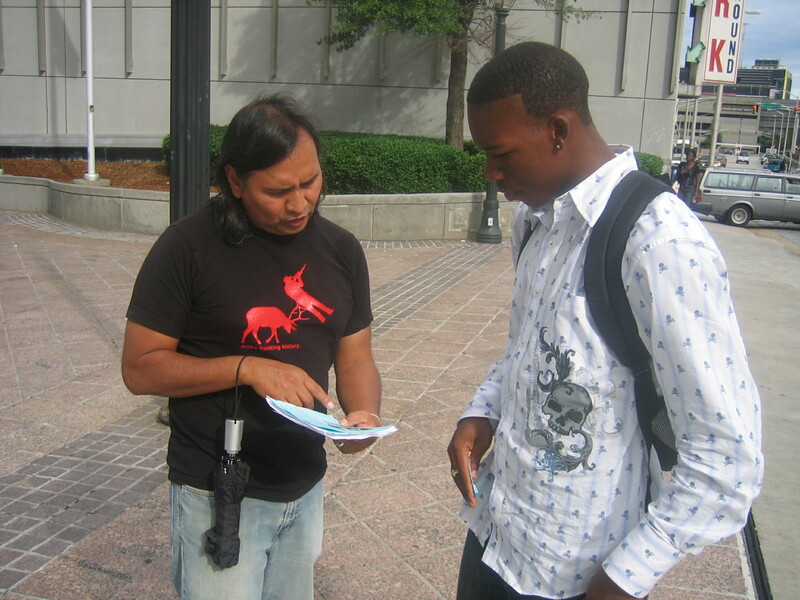 Dianne Mathiowetz of the International Action Center Atlanta said Zelaya was unseated only because he was trying to make improvements, such as raising the minimum wage and opening trade opportunities with other Latin American countries. “They [coup leaders] don’t want any change in the status quo,” Mathiowetz, who recently returned from a trip to Cuba, said. On November 11, 2008, Zelaya announced his intention to hold a non-binding poll of public opinion to assess Hondurans’ desire for a National Constituent Assembly to draft a new constitution to replace the 1982 version. The Supreme Court of Honduras, the National Congress, attorney general, and the supreme electoral tribunal all opposed the idea. A so-called “first instance court” in Tegucigalpa, the Honduran capital, ruled the poll unconstitutional. Zelaya moved forward with plans to hold the poll, marching with supporters on June 26, 2009, to a military base to take possession of the ballots to be used in the poll two days later. In the early morning hours of June 28, the military arrested Zelaya and expatriated him to Costa Rica. No other country has yet to recognize the change in power. The Obama Administration and other leaders in the Western hemisphere have insisted Zelaya be restored to power, yet the United States has yet to make any moves. “The United States has the power to stop this and they won’t,” Sofia Lipko said. She suggested freezing bank accounts, cutting off military aid, and bringing U.S. Ambassador to Honduras Hugo Llorens home. The Organization of American States sent a delegation to Honduras this week to arrange the reinstatement of Zelaya with no success. But there are signs of movement in the United States. Secretary of State Hillary Clinton is reportedly considering action against Honduras, the Associated Press reported Friday. A senior U.S. State Department official told the AP that Clinton’s staff is urging her to sign a determination that the June 28 incident meets the legal definition of a coup d’etat. If Clinton signs such a determination, the AP reported, it could set in motion the suspension of $215 million in U.S. aid under an anti-poverty program run by the Millennium Challenge Corp. Meanwhile, Micheletti, speaking to the New York Times newspaper Friday, outlined a plan that could lead to a resolution, including his resignation. Micheletti told The Times he would resign only if Zelaya resigns, leaving the presidency open to Jorge Rivera, the president of the Supreme Court and supporter of Zelaya’s removal. Micheletti proposed the same idea last month but it fell on deaf ears. Demonstrators on Friday found flaws with the idea. The de facto president also offered to allow international observers into the country to monitor November’s presidential election. Additionally, Micheletti would support a congressional amnesty that would free Zelaya and shield any officials responsible for the coup from legal consequences. Mathiowetz argued bringing in observers to monitor the election would be a moot point if there are no candidates on the ballot willing to represent the needs of the people. Activists APN spoke to Friday agreed Micheletti is essentially stalling for time until the November election. “The delay strategy that the junta is using is working for them and they’re likely going to continue to delay as we approach the November election,” Vosburg-Casey said. Fletcher said he hopes Honduras can avoid the same fate as Chile, a country that went through a coup in September 1973, leaving 3,000 people dead and 30,000 people in jail. The US was responsible for supporting that coup by General Pinochet, which overthrew Salvador Allende. CORRECTION: An earlier version of this article stated the Chilean coup was by Allende; but it was the opposite: Allende was overthrown by Pinochet. We regret the error.